So, there I was, setting up my “save the date” wedding site for my approaching nuptials when I noticed that my pre-made layout asked me to include information about accommodations for guests. “Huh!? What!? You mean, I can’t just ask people to come from all over the world to see me and leave it at that… I have to find them places to stay TOO, but where!!! 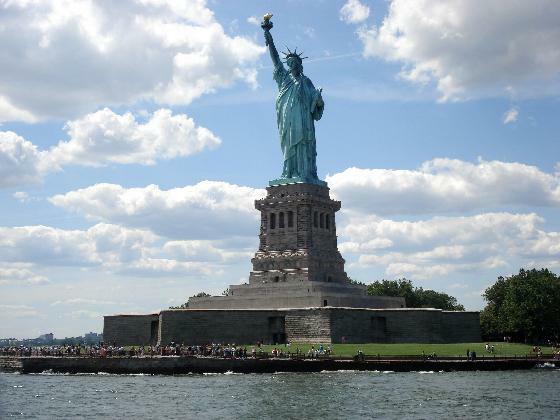 ?” I was embarrassed by my own, goofy question, seeing as I’m in the middle of New York City. I knew for sure though that I had no idea what to suggest to potential out-of-towners as far as reasonably priced hotels, in and on the outskirts of New York plus things to do to keep them occupied. HELLO!!!? It’s Manhattan; it would be hard to *not* find something to keep one’s self entertained let alone a place to stay, but where to begin? Don’t be deterred by the New Jersey address; This cozy hotel, away from the hustle and bustle, is 10 minutes outside of Manhattan, conveniently adjacent to the PATH train station, and also offers the option of catching the ferry to the City, as well as checking out Ellis Island, the Statue of Liberty and other interesting sights to see. 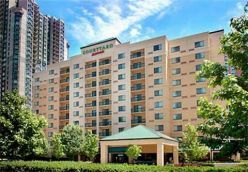 Reasonable group rates are presently available for $167 a night. If you’re up for some excitement and spending a little cash then, staying in the heart of Times Square is a MUST! Consider a liaison with the Great White Way while staying at the Hilton’s DoubleTree Guest Suites. 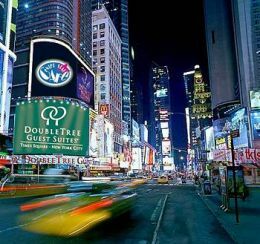 To sweeten the pot, the DoubleTree is offering a “Shop ‘Til You Drop in New York City!” special, available through December 2010. AirBnB.com: Instead of a hotel try a Luxury House, Cheap Apartment or Vacation Rental! Hotels.com: Choose from luxury to cheap, bed and breakfast to 5-star hotels. Read reviews, detailed descriptions, maps and quality photos. Book today and save with their Price Match Guarantee. Expedia.com: Plan a trip, book cheap airfares, purchase airline tickets, make hotel reservations, and find vacation packages, car rental & cruise deals at the travel agency rated #1 in customer satisfaction. GreatPlacetoGo.com: Gifts from across America! GrandSlamNewYork.com: Your source for all things New York!